Birdie Sling, originally uploaded by the workroom. I tend to tote too many things back and forth from home to the shop. Piles of fabric that need to be washed and dried for projects, books, my camera, Maisy supplies, various groceries, wallet, and all the other extra bits of things that I may or may not need on a daily basis. The new Amy Butler pattern for the Birdie Sling arrived at just the right time. I was starting to feel like a sloppy bag lady. This was my first attempt at one of her handbag patterns. So far, I really like her patterns a lot. There was a glossary of terms included with the pattern that explained all of the technical terms quite clearly. The pattern calls for both fusible interfacing and fusible fleece. I didn’t have any fusible fleece and just did the interfacing only. I’m happy with how it turned out, but if you want a much ‘stiffer’ band around the top, you might include the fleece. There are two pockets on the inside, which could easily be further customized with a zipper or additional compartments. My goal was to finish the bag as quickly as possible, so I passed on doing additional any work. The one thing I did do, was make the small pocket using the handle fabric for a bit of contrast inside the bag. This bag is amazing! You wouldn’t believe how much stuff it can hold and the shoulder strap is very comfortable. The design is very smart and easy for a beginner sewer. I learned a lot of great tricks from making this pattern. I especially like the curved gussets at the bottom and the pleating along the top. I absolutely recommend this bag for both looks and function. I’ll be slinging this birdie with me everywhere from now on. This is so cute! I’m often wary of bag patterns, cause the finished product always looks a little too homemade for me. Don’t get me wrong, I love making stuff, but when it comes to things I wear or carry, I don’t want to be stuck with something that looks like a home ec project. This looks great, though. I love the style and the fabric. 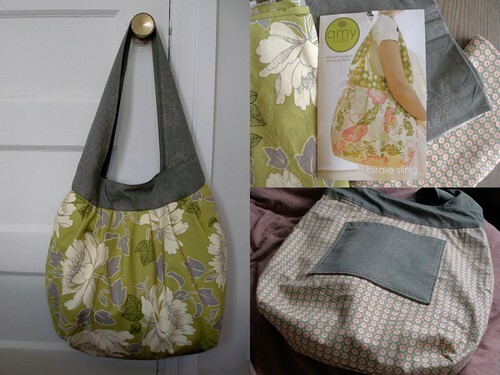 tasha – I agree with you, often times handbag patterns turn out looking very ‘homemade’, especially the very structured ones that require precision sewing and all kinds of interfacing. I think that’s why I like this style so much, it’s nice and slouchy. hey karyn – i’m looking to make one of these, with some nice fabric of course. any ideas on patterns? i’ve been searching on the internet and haven’t come across anything except ugly contoured fanny packs… maybe i’ll just have to come up with my own pattern. angelune – I don’t think I’ve ever seen a fanny pack pattern, but it’s a good idea to design a cool looking one. I found this one on flickr – i like the look. This project may require some freestyling. Keep me posted on what you do, I think I could use one too. I found this one and this one on etsy. No patterns, but I think I could freestyle something (then maybe sell the pattern? ).